Starting a presentation can be a nerve-wracking experience. You want to appear confident and you want to set the right tone. But how exactly do you start? Fortunately there are some time-honoured ways in which you can begin a presentation. That’s because they are tested and proven with audiences. Here are five ways for starting a presentation. Reference. Many of the best presentations begin with a reference to someone, something or some event from the past. This works, since it helps you to set your presentation in the context of a broader picture. If you begin a presentation with a reference, you will find that it boosts the importance and value of your presentation. This PowerPoint presentation used a long historical reference as an introduction. Drama. A dramatic introduction to a presentation will seize the attention of your audience. Subsequently, you then have the opportunity to keep that attention for the rest of your presentation. Certainly, you can’t doubt the drama in this DJ Koh presentation organised by Samsung. Novelty. A novel beginning to your presentation could involve you presenting from somewhere other than the podium. It might even involve external props, sound, noise or other people. And, because it’s different your audience will be attentive. Because that’s certainly what Prime Minister Netanyahu wanted with his UN presentation. Questions. When you start your presentation with a question you signal to your audience that you intend to answer it. It’s an age-old presenting technique that’s best not overlooked. Therefore, why not give it a go when you begin a PowerPoint presentation? Humour. You can use humour when you start your presentation. It sets a certain tone that you can then follow. However, beware of using humour when you begin your presentation if the rest of your content is really serious. That’s because the contrast might not fit. 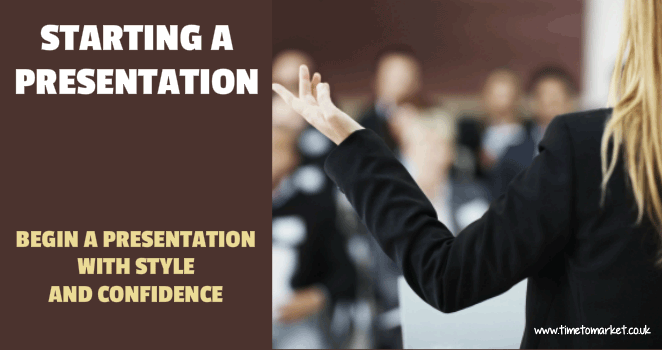 Here are 5 top tips to help you start your presentation with maximum confidence and style. Use a reference to set your presentation in context. Employ something novel, such as a prop. Ask your audience a question…and then answer it. Of course, you can practise starting a presentation with a public presentation training course at your nearest PresentPerfectTM training centre. You are never that far from one of our training venues because we have more than 40 that we use. Alternatively, you can always arrange a corporate training event at your premises. Please call when you are ready to discuss.